Ivy, Sheila and Valeria visited High Bishopside in July 1999. This farm is the subject of the indenture (a document of sale) dated 17 March 1650, which passed Bishopside to Nicholas Fairlamb and his heirs. This page deals with the land and and farm-buildings; for details about the document visit the 1650 deed page. The earliest reference to Bysepsid thusfar is on 21 March 1275/6. A resolved dispute, between the estates of the Archbishop of York and William de Swyneburn over rights to common land, is recorded by the York authorities. Thirteenth century settlements in that part of the valley included Bysepsid (Bishopside), Aldton (Old Town), Stawrth (Staward), Cateden (Catton) and Alwenton (later, Allenton and Allendale Town). The principal farm is High (or Over) Bishopside. 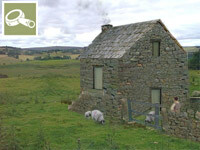 Fairlambs were also living at the adjacent farm of Old Town in 1650. The present farmhouse dates to the eighteenth century, and may well have been built by the Fairlambs. 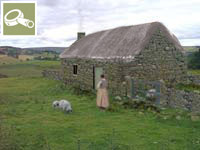 A stone dated 1667 is built into one of the byres and is said to date from the earlier house. Just down the valleyside is the ruin of Low Bishopside which dates from the fourteenth century and is an example of early defensive vernacular architecture. The ruins of Low Bishopside stand on a spur of land between the East Allen valley and a minor tributary, Bishopside Cleugh, 350 m south-west of the present farm of Bishopside and 4 km east of Catton. The ruin is of earlier date than the present High Bishopside (which is higher up the valley). The building was standing and part of the farm when it was bought by Nicholas Fairlamb. The east part of the ruin is formed by a bastle, 6.8 m long by 6.0 m wide. This was a defensive building, dating back to the fourteenth century. Visiting the site today one can see why; it is an excellent defensive site above a steep slope to the Allen, with uninterrupted views up and down the valley and a commanding sight of the bridging site at Cupola. The side walls are a massive 0.9 m thick, the end walls 1.3 m, each constructed of roughly-coursed rubble and large roughly-squared quoins; the surviving eastern gable end has massive triangular-shaped coping stones. The western part of the building is a later extension, c.1667 when Fairlambs owned it. It is the same width as the bastle but 9.5 m long, with side walls 0.65 m thick and a west end of 0.90 m, is also of rubble, but with less massive quoins. The farmhouse was inhabited into the twentieth century when Robert Dixon's family took off the roof for use in other farm buildings. Therefore, most of the decay of the building is less than a hundred years old. The only features in the earlier part of the building are a centrally-set first-floor slit in the east end, a set back 1.5 m above ground level in the internal face of the same wall, and ragged holes for transverse beams in the internal face of the north wall. The west end has been completely removed, and only a few footings remain of the south wall. In the extension there are traces of a firehood against the internal face of the west gable end, with wall cupboards in the adjacent side walls; the sill of a two-light mullioned window lay amongst the tumbled remains of the south wall. Low Bishopside is one of a group of small almost square bastles in Allendale which may be of slightly earlier date than most in Northumberland. The present High Bishopside is an eighteenth century farmhouse; built into an internal wall of the adjacent farmbuildings is a stone dated 1667 and said to have come from the old house. This may be from the Low Bishopside extension (rather than the bastle) or from an earlier High Bishopside farmhouse. Small fortifications, called peles and bastles, are scattered throughout the Northumberland countryside and stand as romantic and often eerie reminders of the county's border past. Link to further information on bastles. Peles or pele towers are the most common. These are stone-built, oblong tower houses, measuring approximately 12 m by 9 m, with walls around a metre thick. Found on both sides of the border, the pele towers were virtually impregnable against raiders and marauders and were lived in by the rich and poor alike. They usually consisted of a tunnel-vaulted ground floor for storage and livestock refuge, along with two or three upper storeys accessible by a narrow spiral staircase. Access to a pele tower could be gained through two sets of doors, the outer made of iron the inner of oak. To ensure the tower's defences were complete, windows in the peles were very small and kept to a minimum. Border pele towers can date from as early as the thirteenth to as late as the seventeenth century, but were all built to very much the same pattern. 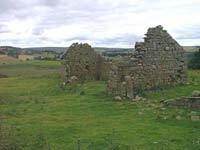 The vicar's peles found in some parts of Northumberland are so named because they were once inhabited by local vicars or rectors. Bastle houses are a variation on the pele tower, but are a lot less common. These are fortified farm houses rather than tower houses and tend to be found in remoter areas of the border country, usually not far from the border itself.